This is definitely my must-try falafel place! From the outside, it doesn’t look like something you would choose at first sight. It’s more like the last place open a Sunday night, with its neon light shining bright; with its screaming greenish façade and the bubbly fonts it calls to mind a weird mix of tamagotchis, flubber and a Dutch chip shop. But if you go inside and try the food, you’ll change your mind for sure! Fresh ingredients and herbs and homemade food in this ambiance give you a totally new experience of Lebanese food. I don’t know if it is super traditional since they use some of the same sauces the Dutch chip shop would use, but I enjoy it and recommend the hot sauce. They also offer a great price to performance ratio. 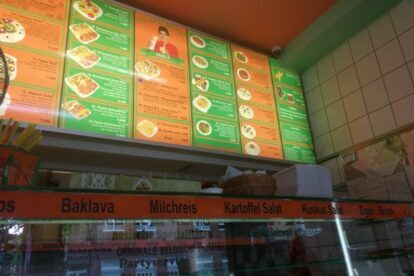 For example, a big falafel is only 4 Euro and it will keep you going for hours – and it is tasty as hell.